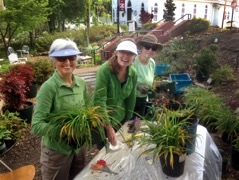 For many years the NGC has held a plant sale in the spring. This year is no different and we’re excited to offer the plant sale April 12-13, 2019. 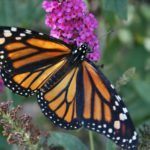 Why hold a plant sale? There are a number of reasons that we hold this sale. It funds the budget for the upkeep of the Garden Club cottage at 33 College Street. 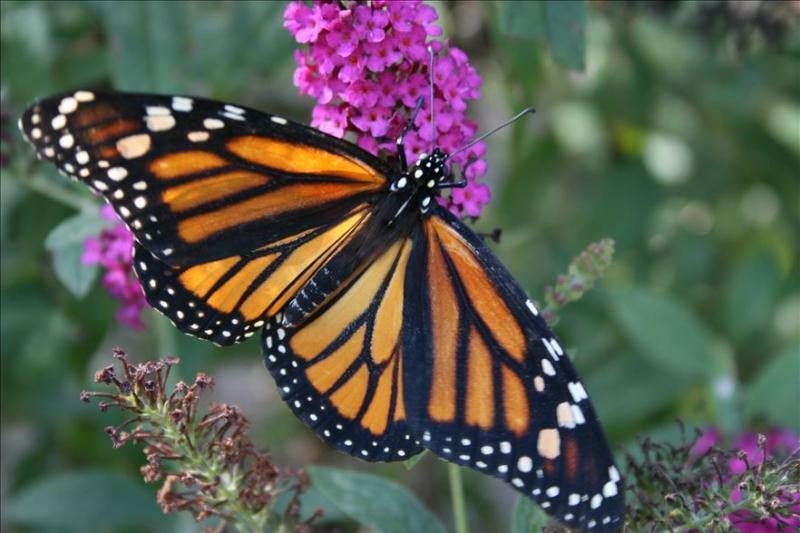 It allows us to contribute in support of the aims and goals of the Garden Club of Georgia and the National Garden Clubs. It helps us award scholarships to local students for summer camp and facilitates participation in local events such as the community garden, the farmers market and other focused activities. One of the main benefits of this sale is how it brings us together in the education of our membership and the community that supports it. We work together in each others gardens; we learn how to propagate, plant and pot. We share our knowledge and teach and learn from our newer members. We combine our talents and interests and find a way for all members to contribute. New customers become old friends and members. We engage our local merchants. We have become a noteworthy part of the calendar of activities in Norcross. Starting in March we will go to each other’s gardens as well as others to dig and pot pass-along plants. This could be two or twelve members depending on the work to be done. The plants are then “fostered” either in that garden or taken home by the participating members to be cared for and grown out. The week before the sale these will be brought to the garden club and prepped before being arranged around the grounds for the sale. The day of the sale members don their green aprons and help our shoppers find the plants they want plus some new ones! Interacting with new and old customers is one of the joys of the event, and of the year! Our Brown Bag raffle in the cottage is well supplied with donations from the local merchants and contributions from our talented members. These are two busy and fun filled days ending with the drawing for the winners in the raffle. Returning this year: Ask a Master Gardener and Annandale yard art for sale. New this year: The Norcross Community Market joins us in Heritage Park with a variety of local vendors offering local delicacies, sweet and savory along with herbs, honey, and fresh cut flowers. Cleanup will occur that day and through the next week. In May we celebrate with a picnic in the community garden with congratulations all around. The list of events noted below can be synchronized with your calendar from various devices and types of calendars. Click the Subscribe button found in the lower right corner. Choose the calendar and voilà, you will have your calendar updated with the events. Never miss a meeting. A Photo Workshop with Eric Bowles will be held this Sunday, April 28th, 2 to 5PM at the clubhouse cottage. 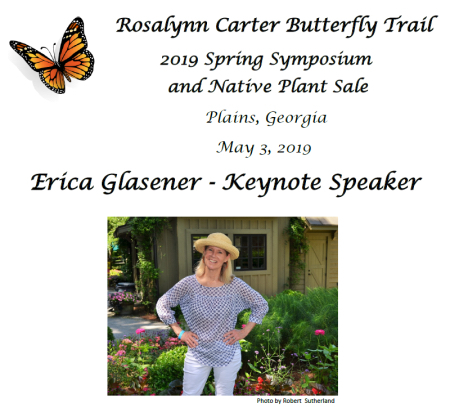 The 2019 Rosalynn Carter Butterfly Trail Spring Symposium will be held on May 3, 2019, in Plains, GA. The featured speaker is Erica Glasener, well-known author and HGTV and Create TV host and producer. Ernest Koone from Lazy K Nursery will be there, presenting and selling his Rosalynn Carter Native Azaleas. There will also be a plant sale with many native plants available. This is expected to be a sell-out event, so garden club members need to register early. This symposium is co-sponsored by The Garden Club of Georgia, Inc. 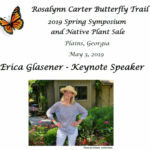 Symposium details are online at www.rosalynncarterbutterflytrail.org. For additional information contact Annette Wise 229-824-4567 or Willie Maxwell 229-938-5830. Visit the Symposium website for form and registration. This year’s secret gardens will emphasize many unusual and themed plant combinations such as mature hardy tropicals, a Japanese inspired koi pond, Buddha meditation area, a magnificent moss lawn, a winding series of stacked stone paths and stairs featuring a collection of unique shade and sun perennials, conifers, native hardwood trees and shrubs and plenty more interesting features. You’ll love the convenience, since this year’s eight tour stops are all located along the Old Alabama Road corridor between Highway 141 and Haynes Bridge Road. This should make it very easy to visit and leisurely enjoy each tour location without feeling rushed! NEW THIS YEAR! We’ve added a unique addition in 2019 that will delight nature and history lovers alike. The Autry Mill Nature Preserve (http://autreymill.org) is our educational tour stop where you’ll be able to rest and listen to interesting speakers on a variety of gardening topics presented in the unique historical buildings on the beautiful property. This bucolic setting includes a series of woodland trails over bridges and streams, a butterfly garden, a grist mill, wetlands, and animal exhibits. Of particular interest to many gardeners will be the fragile and endangered wildflower, Pink Lady’s Slippers, which should be blooming during your visit. You won’t want to miss it! We look forward to seeing you on this beautiful day. We will let you know when on-line passes go on sale in early Spring. 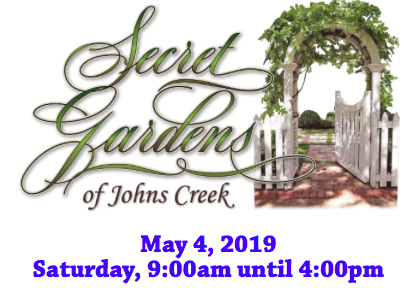 Visit our website at www.johnscreekbeautification.org for more information soon! Brought to you by Johns Creek Beautification, Inc. — Creating an exceptionally beautiful Johns Creek. Join a group of members at the Ansley Golf Club for the annual awards banquet.